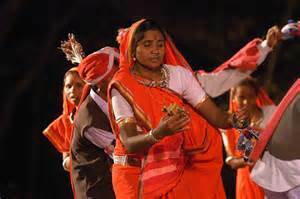 Jawara Dance of Madhya Pradesh: Jawara is performed in the Bundelkhand area of Madhya Pradesh. It is essentially a harvest dance-reflecting the gaiety and pleasure of the peasants who have reaped a good harvest. The dance is performed by men and women together. The costumes and jewellery worn by the women are colourful. The women carry baskets full of jawara on their heads and although the dance is very vigorous they are able to balance these baskets very skillfully on their heads. The accompaniment includes a rich variety of percussion, stringed and wind instruments. This dance art is usually performed at the time when people of Madhya Pradesh want to rejoice and spend good moments for their fine harvest reaping. Bundelkhand people are so skill full that they know well Jawara dance. They know all the steps and forms of this dance. Furthermore women make sure to carry all the brisk movements while dancing this Jawara dance form so that their dance can be announced more unique and perfect. I once knew this amazing Japanese lady and even though her culture has the most elegant form of dance, she chose to go for this form. Here you can get https://www.analyzedu.com/writing-services-reviews/edugeeksclub-com-review.html more helpful info for all level of students. She has become quite famous now and still tells people that she wants to work harder to become a master. Honestly, this is a very pure form of art.